If your edible or ornamental gardens have the right space, a nicely designed entry adds anticipation and dimension to them. As well as creating a warm and inviting welcome, a garden entrance can segment a space into garden rooms or highlight a focal point like a statue or piece of garden art. It can frame a space and paint a picture in broad brush strokes or in precise and vivide detail. A garden entry tells a story. How you allow yours to unfold is up to you. From vintage door gates to a beautiful garden arbour, an abstract Corten entry or a pretty pathway lined with blooms, there are many diﬀerent ways you can make a signature statement. 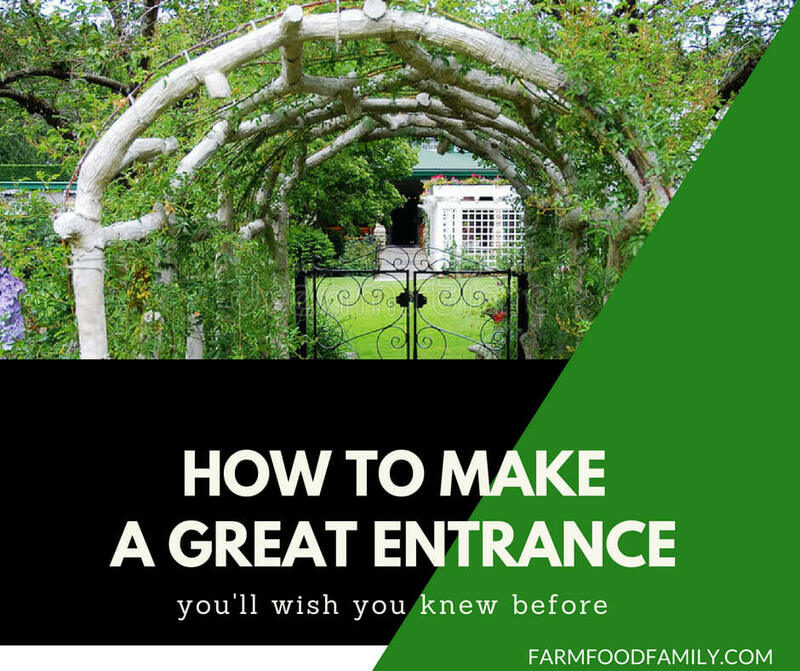 So what is a garden entry? It can be many things, but essentially it’s a point of transition from one area of the yard to another or from the street to the garden. As well as creating a warm and inviting welcome, a garden entrance can serve many purposes. It can segment a space into garden rooms or highlight a focal point like a statue or piece of garden art. It can frame a space and paint a picture in broad brush strokes or in precise and vivid detail. A built entrance gate is a little bit like a full stop in a sentence. You pause, then move on to the next part of the story. It segregates spaces in a definitive and often linear way. See-through gates allow the viewer a glimpse of what lies beyond, so there is more free flow and a greater sense of connectedness between the areas. A solid gate evokes a sense of mystery – you don’t know what lies beyond, until you step over the threshold. For a sculpted modern look, ornate carved timber can work well. For a vegetable patch entry gate, repurposed steel farm implements fitted to the gate oﬀer a creative touch. A garden arbour adds charm and helps to edge a garden entrance. If it’s in a front garden, make sure the architectural style and scale work with the home. It also should be generously proportioned – no smaller than the width and height of a large door frame. Grow climbing roses over the top for a touch of romance, or deciduous climbing hydrangea. There are also edible plants that suit arbour growing, whether it’s annuals like runner beans or cucumbers or perennials like passion fruit or grapes. The arbour itself can comprise a bought or built archway structure or it can be formed by the pliable trunks of smallish trees that are suited to espaliering, such as apples and pears. Plants growing over a built structure soften it, blurring the lines between hard and soft landscaping. If you plan to grow vines on the structure it will need to be made of material that’s robust enough to take the weight of the plants. A pair of pots, or even an eclectic selection can create a stylish garden entry. Architectural or structural plants like yuccas create a modern look. For cottage-style gardens, plant old fashioned pin cushion flower, sweet smelling lavender or dianthus. Potted ornamental peach, dwarf apple, olive, fig or citrus can frame an entry to the vegetable garden. In Asian inspired gardens, bird of paradise or lady palm in containers set the tone for the garden beyond. Pathways from an entry can be straight, angular, winding or even circular. Play with shapes for something unique. A winding path takes you on a journey. A preloved red brick path, random crazy paving and crunchy gravel underfoot are all ways to highlight a garden entry. Alternate pavers and grass, or sleepers and grass, for something unique. Plant dual borders either side of a path and fill it with flowers such as lavender or salvia. Use taller shrubs as a backdrop and add splashes of color with vibrant plants. Get creative with textures using plants that invite you to reach out and touch them, and plenty of layering to create interest. a repurposed chest of drawers with flowers spilling over. Objects and whimsical planting inside a garden entry invite the viewer to slow down, to appreciate and immerse themselves in the beauty of the garden and to stay a while. Appeal to the senses by planting fragrant blooms like yesterday-today-tomorrow or gardenias. Add a mosaic water feature for a soothing ambience with a backdrop of star jasmine for a heady fragrant entry. Include a pretty or unique bird feeder in the garden entry to invite birds into your garden. A garden entry can be far more than a way to connect spaces or point the way. An entry can also be a place to sit and relax. Pop in a garden bench seat, a table for two, or a cosy chair. Add some green screening as a privacy backdrop or a piece of garden art you love. It’s the perfect place for visitors to sit and comfortably admire the garden beyond. Or for you to unwind with a cuppa after a day’s work in the garden.